In many science fiction films of the Cold War period the cosmos is represented as an extra-terrestrial space in which international rivalries have been overcome. ‘Der Schweigende Stern’ (The Silent Star) depicted a world in which communism had swept the planet and mankind now enjoyed the benefits of nuclear technology, social equality and international fraternity. Internationalism was not only the theme but also the method of this movie: it was based on a book by Polish science fiction writer Stanislaw Lem and shot in East Germany with an international cast. The film depicts the discovery of a mysterious object in 2003 which contains a coded message threatening the Earth’s destruction. A spaceship is dispatched to Venus, the source of this message, with an international crew. There, they find only the ruins of the warlike civilization which had itself already perished in a nuclear civil war. The Cold War message was clear to all. 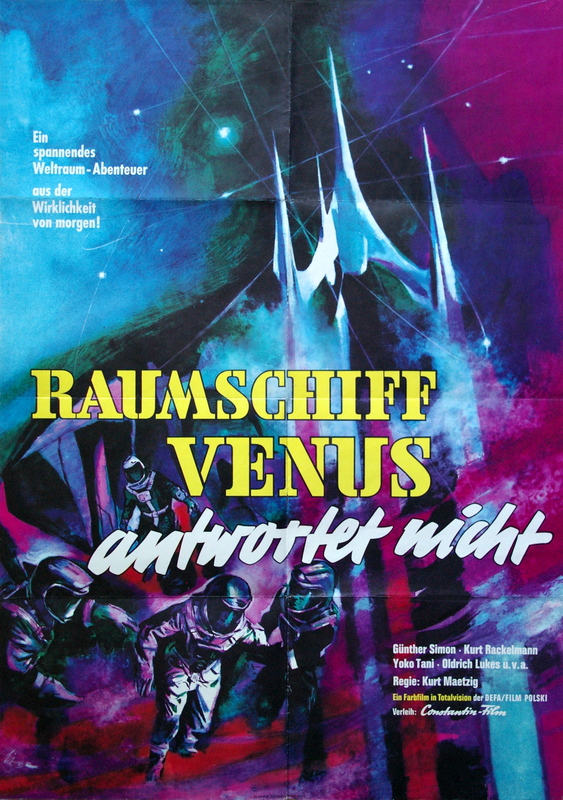 Interestingly, the film was distributed in America under the title ‘First Spaceship in Venus’ where its latent communist message was less important than its capacity to satisfy the tremendous popular demand for science fiction. The poster distributed in the USA stressed the dramatic experiences of space travel which could be enjoyed from the comfort of the cinema seat: ‘You are there …, You are there …, You are there …, You are there …, You are there …’. Not surprisingly Polish designer Wojciech Zamecznik’s horizontal poster capture Lem’s intentions best. The ‘star’ – which has sent the message has fallen silent, a deathly planet on which life has been extinguished. It is presented as lifeless face. The only allusion to the ideodological subtext appears in red trail which follows the cosmonauts as they fly through the dark night of space.